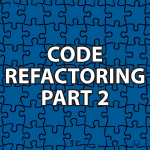 In this part of my code refactoring tutorial I talk about some basic concepts you have to understand. I’ll cover the process of method extraction. This will help you break down many lines of code into understandable blocks. I’ll also cover when not to extract methods and how to handle temporary and local variables. This tutorial series starts off slow, but by the end many complicated code refactorings will be covered. The code follows the video.